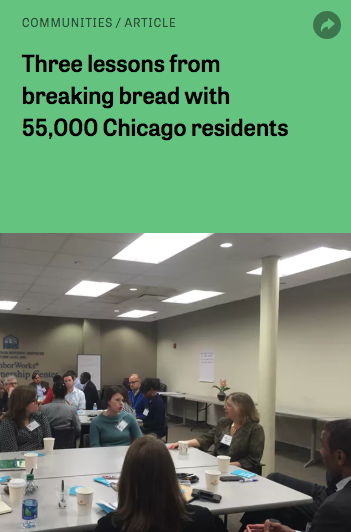 In 2014, The Chicago Community Trust held its inaugural On the Table, which was designed to bring people together in small mealtime conversations for the purpose of brainstorming innovative solutions to address their communities’ most pressing needs. Inspired by The Chicago Community Trust, The John S. and James L. Knight Foundation took On the Table nationwide in 2017 with 10 community foundations serving as partners to implement the initiative in their regions. Through the support of the Knight Foundation, these community foundations organized thousands of conversations across their 10 regions with an estimated 40,000 participants. Out of the total number of participants, 12,182 responded to a post-conversation survey administered by the University of Illinois at Chicago’s Institute for Policy and Civic Engagement. This report summarizes survey respondents’ answers to questions about their demographic background, what they discussed during conversations, and the impact of their conversations. In addition, this report provides analysis and observations designed to help conveners, practitioners and hosts as they seek to increase the impact of future community conversations like On the Table. Survey respondents’ self-reported demographics revealed that On the Table conversations were attended by people with a wide variety of backgrounds. Relative to local populations, respondents with less than a bachelor's degree were by far the most underrepresented demographic group across all sites. Additional steps should be taken during planning, outreach and data collection to maximize diversity and inclusion in community conversations and expand the range of voices included in On the Table. The prevalence of Equity and Social Inclusion, Economic Issues and Poverty, Education and Youth Development in diverse regions across the country suggests that if conveners hold a general, non-themed community conversation, they should expect participants to discuss topics related to these themes. Local context and priorities also matter. If transportation, for example, is a priority issue in an area then participants are likely to bring it up in conversation. Furthermore, focusing On the Table around specific topics can strongly influence the content of the conversation, as shown in Silicon Valley, where 82 percent of comments were related to housing and homelessness, which was the intentional focus of the initiative in this region. The report refers to respondents rather than participants because the results of the survey cannot be generalized beyond the respondent population. A #LetsTalkPhilly conversation in 2017. Photo courtesy of The Philadelphia Foundation. Most participants gained new understanding of how to address issues facing their community. The majority of people (58 percent) said they gained a somewhat-to-much better understanding of how to address issues in their community. On the Table spurred new connections with neighbors and encouraged civic action. Many respondents reported making new connections with other respondents, including speaking with someone new (62 percent), making plans for future action (18 percent), and exchanging contact information (28 percent). Nearly 9 in 10 respondents (86 percent) said they are somewhat-to-very likely to take action after On the Table, with 40 percent saying they are very likely. Knowledge is power. Learning about new ways to address community issues encouraged civic action, among both those who are very involved in their community (87 percent) and those who aren’t (72 percent). 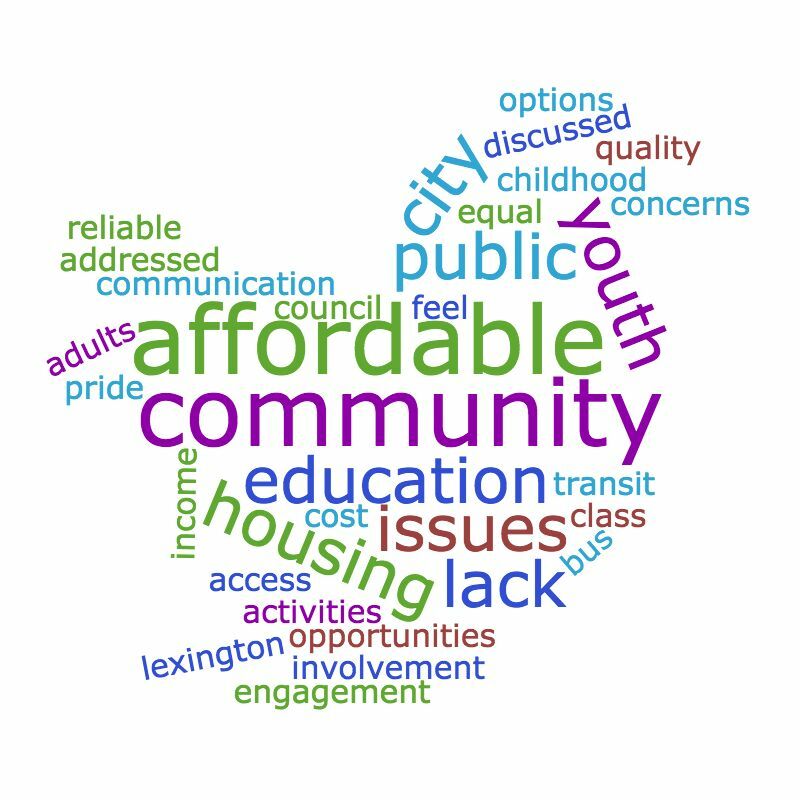 In contrast, those who said they did not gain a much better understanding of how to address issues in their community were not likely to take action after On the Table, both among those very involved in the community (48 percent) and those who aren’t (26 percent). The equity and social inclusion category uses a social justice lens to account for forms of exclusion and issues of access and equality for underserved groups. This category refers to youth access and engagement concerns, racism, LGBT inclusion, and issues of disparity as noted across income levels, racial groups, and neighborhoods. The transportation category refers to transportation access and transportation infrastructure. The economic issues and poverty category refers to economic development on the one hand and economic insecurity or poverty on the other. It covers unemployment and jobs as well as income inequality, wage, and workforce development issues. The public safety and judicial system category may refer to the criminal justice system as well as public safety and crime, including instances of gang violence, gun violence, drugs, trafficking, police misconduct ,and how officials such as police can better provide community security. The education and youth development category refers primarily to schools and students with additional focal points on mentoring and general youth development. It is also inclusive of other related topics such as parent involvement, after school programs, job training, and education research. The housing and homelessness category primarily refers to homelessness and issues around home ownership and renting responsibilities, especially housing affordability. To increase post-conversation action, make sure participants are learning new ways that they can address community issues and are making specific plans for future action with each other. Learning and making plans are powerful and effective methods for inspiring action, so much so that they inspire respondents who are less involved in their community to say they will take action at similar rates to the most involved. To increase participants’ understanding of how to address community issues and make specific plans for future collaboration, make sure conversations are solutions-oriented. Learning and making plans are most likely to happen for respondents who take part in solutions-oriented conversations. Conversations served as a catalyst for generating ideas and potential actions and created a space for participants to make personal connections so that they might find ways to ignite change with fellow residents. With the goal of bringing about greater local action, the insights in this report provide conversation organizers with actionable strategies to further the impact of future On the Table initiatives.